January is a popular time to begin healthy lifestyle plans, but that doesn’t have to mean eliminating fresh baked goods. Some simple tricks can keep familiar favorites on your ‘good list’, like using flaxseed meal in muffins or breads. Flaxseed meal is a source of omega 3 fatty acids, and can replace up to 2/3 of the fat in muffins or breads, plus it adds extra fiber. 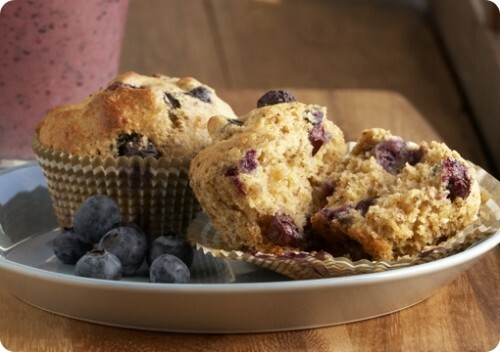 This muffin I developed for Driscoll’s berries is moist and light, and is packed with whole grains. Look for flaxseed meal in 1 pound bags (I usually buy Bob’s Redmill brand) either in the baking or health foods section of most supermarkets. Preheat oven to 400ºF. Line 12 muffin cups with papers or coat with cooking spray. Combine dry ingredients (whole wheat flour through salt) in a large bowl; stir well. Stir together yogurt, oil, eggs and juice or water in a small bowl. Add to dry mixture; stir to nearly blend wet and dry ingredients. Bake 18 minutes or until golden brown and pick inserted in center comes out clean. Remove muffins from pan and cool on wire rack. – Flax is a blue flowered plant native to the area from the Mediterranean to India, now grown in the cool climates of the northern US and western Canada. – Grown for both seeds and fiber: seeds produce milled grain and oil; fibers produce linen textiles. – Flaxseed oil is also known as linseed oil, has a strong flavor, and is used in low amounts as a nutritional supplement high in omega 3 fatty acids. – The seeds need to be ground to produce the most useable digestive fiber. Two tablespoons flaxseed meal has 4 grams fiber. – Golden and brown flaxseeds are different varieties very similar nutritionally. – 3 tablespoons flaxseed meal can replace 1 tablespoon of fat in baking (other adjustments may be needed). Hey, Rita. I’d love to see that Moroccan salad of dates and oranges with a cumin-laced dressing that you alluded to on Wimpy Vegetarian’s blog. I came over here looking for it but had no luck. We still have way too many oranges (and probably will have through March). I L-O-V-E these!!!! I’ve been looking for a good healthy muffin that would incorporate whole wheat, wheat bran and flax seed. You must have been reading my mind. I’m making them this weekend. Thanks!! Hey, I’m so glad I could help! Let me know how they turn out. I think I forgot to tell you I made your Moroccan Orange Salad. It’s wonderful! I’ll be using the combination of citrus and olives again! Oh! And great, great photo!